This is theKing of the great vinegars. The most widely known and most praised throughout the world. It is aged for a minimum of twelve years following the most ancient of traditions. 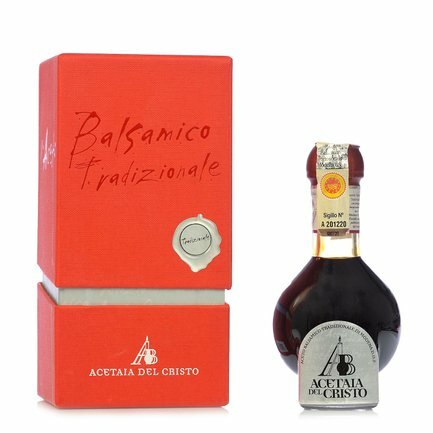 Eataly has chosen the balsamic vinegar of Acetaia del Cristo because it is produced to the highest standards of quality, giving a fullyauthentic taste of the Emilia region. Ingredients Cooked grape must. Contains natural sulphites. For more information on product labels, please contact our Customer Service department. The information on the labels of the products may vary for reasons beyond our control, therefore, there may be discrepancies between the information on the site and that on the products delivered. Please always check the information on the product before consumption or use. For three generations, Acetaia del Cristo has been working hard to continue the antique balsamic vinegartradition of Modena. Careful attention in the making of the vinegar, meticulous care of the production process details and of the environment make this company a point of reference at an international level as regards the production of Traditional Balsamic Vinegar from Modena DOP. Eataly has chosen Acetaia del Cristo because it producesexcellence in harmony with nature!